My riding partner Andi and I started our cycle in the east coast town of Yilan where we will finish the complete circle traveling the island counterclockwise. We have a 14 day schedule with a couple of rest stops in the city of Tainan and the village of Jialeshui in Kenting National Park. Our route in total covers over 1200 kilometers and is a complete circle which will include navigating the dangerous Suhua Highway on the east coast. 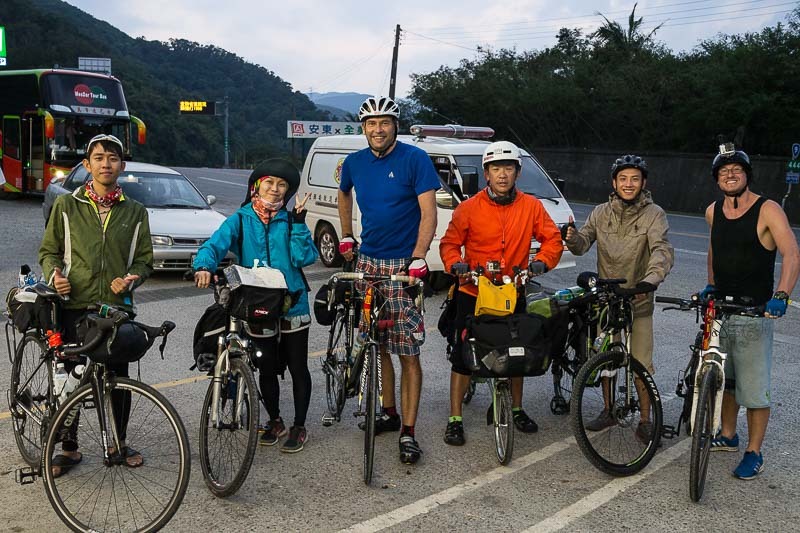 On the westcoast of Taiwan we have been traveling on Highway 17 south with diversions onto wonderful cycle paths that are surrounded by trees and the Taiwan Strait. Traveling through seaside villages eating at small seafood restaurants and visiting temples has been incredibly enriching and in my opinion is one of the best ways to experience the island, it’s people and the culture. Taiwan has managed to keep it’s traditions going for centuries. There are over 15,000 temples on the island dedicated to the Buddha, The Tao, Confucius, and countless folk Gods and Goddesses. Taiwan is also the home of over a half-million indigenous people who are believed to have inhabited the island for over 8000 years. Their ancestors have been linked to other indigenous groups from Malaysia, Indonesia, and The Philippines. We took our first rest day in Tainan, the oldest city in Taiwan. For me it was a chance to catch up on the podcast and enjoy some of the amazing local food. Their are specialities in this city that draw people from all over the island. Most Taiwanese people will light up at the thought of visiting Tainan and eating it’s wonderful dishes. Coffin Toast, milk fish soup, and many other specialties can be found in the Anping section of the city, near the Chikan Towers as well as in other parts of town. A broken spoke on my rear wheel delayed my exit from the town. Andi went ahead of me to Kenting National Park and the village of Jialeshui and I caught up with him a day later. You will most likely find yourself traveling through many urban areas between Tainan and the southern port town, and the second biggest city in Taiwan, Kaohsiung. Riding next to the mob of scooters can be a little challenging but most people seem to respect cyclists and I never had a problem in the city areas. Once you are out of the Kaohsiung city limits you will find yourself around agricultural areas eventually giving way to the sea and Kenting National Park. This is tropical Taiwan-surfing, sandy beaches, and forests filled with wildlife. Many Taiwanese vacation here especially in the winter, to escape the colder climate of Northern Taiwan. The atmosphere is chill, with little bars and restaurants everywhere as well as tiny authentic villages scattered throughout the park. If you can schedule a little more time on your ride hear, do it. It’s the perfect place to rest and rejuvenate before the challenging cyclek up the rugged east coast. Reaching Cape Eluanbi, the southern most point in Taiwan was a milestone for Andi and I, putting us at over the half-way point of our Huan Dao-with the rugged sometimes strenuous cycling of the east coast still ahead. That’s it for this week’s edition of Far East Adventure Travel-the podcast, on the road cycling Taiwan. Next time, the last stage of our Huan Dao-circle of the island and the final push to the finish in Yilan. Far East Adventure Travel The Podcast is brought to you by Far East Adventure Travel Magazine-inspiring you with stories, images and video, for your next adventure in Asia. Simply go to the iTunes App Store, search Far East Adventure Travel-download the app and subscribe. Thanks so much for listening, until then this is John Saboe-safe travels and Namaste!